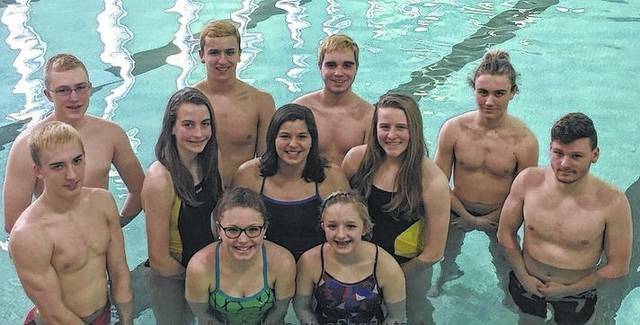 GALION — Several members of the 2017 Galion YMCA swim tea are taking part in the YMCA Zones this weekend at Bowling Greet State University. The action started Friday and will continue through Sunday. The team is led by head coach Mary Fuller and assistant coach Troy Chipka. Participants, and the events that will swim include: Boys 200 Breast – Evan Zmuda; Boys 800 Free Relay – Eli Skaggs, Clay Karnes, Alec Dicus, Landon Rose; Boys 400 Medley Relay – Caleb Strack, Evan Zmuda, Sam Rigdon, Eli Skaggs; Girls 13-14 200 IM – Kaisey Speck; Girls 50 Breast – Kaisey Speck; Boys 50 Breast – Sam Rigdon, Evan Zmuda; Girls 13-14 100 Fly – Kaisey Speck; Boys 100 Free – Eli Skaggs; Boys 50 Back – Caleb Strack, Eli Skaggs; Boys 400 Free Relay – Eli Skaggs, Caleb Strack, Landon Rose, Sam Rigdon; Girls 200 Free Relay – Krassow, Erin Zmuda, Allison DeNero, Kaisey Speck; Boys 200 Free Relay – Eli Skaggs, Clay Karnes, Landon Rose, Sam Rigdon; Girls 50 Fly – Erin Zmuda; Boys 50 Fly – Eli Skaggs, Sam Rigdon; Girls 13-14 100 Breast – Kaisey Speck, Drew Krassow; Boys 50 Free – Eli Skaggs; Boys 200 Medley Relay – Caleb Strack, Clay Karnes, Sam Rigdon, Eli Skaggs.